WRC - VM serien i rally som drivs av promotorn RedBull på uppdrag av Internationella Bilsportförbundet. Det är här vi ser och har sett förare som Sebastien Ogier, Pontus Tidemand, Andreas Mikkelsen, Sebastien Loeb, Marcus Grönholm, Juha Kankkunen, Colin McRae, och Stig Blomqvist! 24-27/01 Rallye Monte Carlo. Monaco. 14-17/02 Rally Sweden. Svenska Rallyt AB. 07-10/03 Rally Guanajuato Mexico. Mexico. 28-31/03 Corsica Linea - Tour de Corse. Frankrike. 09-12/05 Copec Rally Chile. Chile. 30-02/05 Rally de Portugal. Portugal. 13-16/06 Rally Italia Sardegna. Italien. 01-04/08 Neste Rally Finland. Finland. 22-25/08 ADAC Rallye Deutschland. Tyskland. 03-06/10 Wales Rally GB. Storbritannien. 25-28/01 Rallye Monte Carlo. Automobile Club de Monaco. 15-18/02 Rally Sweden. Svenska Rallyt AB. 05-08/04 Tour de Corse. Frankrike. 17-20/05 Rally de Portugal. Portugal. 07-10/06 Rally Italia Sardegna. Italien. 26-29/07 Neste Rally Finland. Finland. 16-19/08 ADAC Rallye Deutschland. Tyskland. 13-16/09 Rally Turkey Marmaris. Turkiet. 04-07/10 Dayinsure Wales Rally GB. Storbritannien. 25-28/10 RallyRACC Catalunya - Costa Daurada. Spanien. 15-18/11 Kennards Hire Rally Australia. Australien. 18-22/01 Rallye Monte Carlo. Monaco. 09-12/02 Rally Sweden. Svenska Rallyt AB. 07-09/04 Che Guevara Energy Drink Tour de Corse. Frankrike. 19-21/05 Rally de Portugal. Portugal. 09-11/06 Rally Italia Sardegna. Italien. 30-02/06 Orlen Rally Poland. Polen. 28-30/07 Neste Rally Finland. Finland. 06-08/10 RallyRACC Catalunya - Costa Daurada. Spanien. 27-29/10 Wales Rally GB. Storbritannien. 17-19/11 Kennards Hire Rally Australia. Australien. 21-24/01 Rallye Monte Carlo. Monaco. 11-14/02 Rally Sweden. Svenska Rallyt AB. 04-06/03 Rally Guanajuato Mexico. Mexico. 22-24/04 YPF Rally Argentina. Argentina. 20-22/05 Rally de Portugal. Portugal. 10-12/06 Rally Italia Sardegna. Italien. 01-03/07 PZM Rally Poland. Polen. 29-31/07 Neste Rally Finland. Finland. 30-02/09 Tour de Corse. Frankrike. 14-16/10 RallyRACC Catalunya - Costa Daurada. Spanien. 28-30/10 Dayinsure Wales Rally GB. Storbritannien. 18-20/11 Kennards Hire Rally Australia. Australien. 22-25/01 Rallye Monte Carlo. Monaco. 12-15/02 Rally Sweden. Svenska Rallyt AB. 05-08/03 Rally Guanajuato Mexico. Mexico. 21-24/05 Rally de Portugal. Portugal. 11-14/06 Rally de Italia Sardegna. Italien. 30-02/07 Neste Rally Finland. Finland. 01-04/10 Tour de Corse. Frankrike. 22-25/10 Rally de Espana. Spanien. 16-19/01 Rallye Monte Carlo. Monaco. 05-08/02 Rally Sweden. 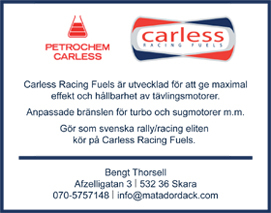 Svenska Rallyt AB. 02-06/04 Rally de Portugal. Portugal. 31-03/07 Neste Rally Finland. Finland. 02-05/10 Rallye de France. Frankrike. 22-26/10 Rally RACC Catalunya. Spanien. 12-16/11 Wales Rally GB. Storbritannien. 15-20/01 Rally Monte Carlo. Monaco. 07-10/02 Rally Sweden. Svenska Rallyt. 11-14/04 Vodafone Rally de Portugal. Portugal. 02-05/05 Philips Rally Argentina. Argentina. 30-02/05 Acropolis Rally of Greece. Grekland. 20-23/06 Rally Italia Sardegna. Italien. 01-03/08 Neste Oil Rally Finland. Finland. 03-06/10 Rallye de France - Alsace. Frankrike. 24-27/10 Rally RACC Catalunya - Costa Daurada. Spanien. 14-17/11 Wales Rally GB. Storbritannien. 09-12/02 Rally Sweden. Svenska Rallyt. 22-24/06 Rally of New Zealand. Nya Zeeland. 13-16/09 Wales Rally GB. Storbritannien. 04-07/10 Rallye de France - Alsace. Frankrike. 08-11/11 Rally de Espana. Spanien. 10-13/02 Rally Sweden. Svenska Rallyt AB. 29-02/09 Rally de France. Frankrike. 10-13/11 Wales Rally GB. Storbritannien. 11/02 Rally Sweden. Svenska Rallyt AB. 12/02 Rally Sweden. Svenska Rallyt AB. 13/02 Rally Sweden. 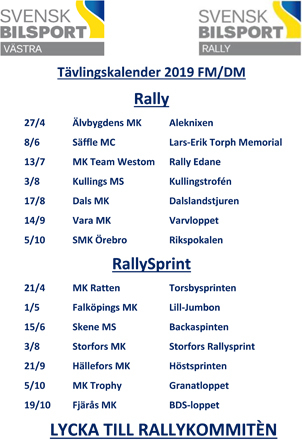 Svenska Rallyt AB. 14/02 Rally Sweden. 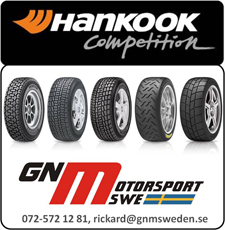 Svenska Rallyt AB. 07/05 Rally Nya Zeeland. Nya Zeeland. 08/05 Rally Nya Zeeland. Nya Zeeland. 09/05 Rally Nya Zeeland. Nya Zeeland. 12-14/11 Wales Rally GB. Storbritannien. 13/11 Wales Rally GB. Storbritannien. 14/11 Wales Rally GB. Storbritannien. 13/03 The Cyprus Rally. Cypern. 14/03 The Cyprus Rally. Cypern. 15/03 The Cyprus Rally. Cypern. 03/04 Rally de Portugal. Portugal. 04/04 Rally de Portugal. Portugal. 05/04 Rally de Portugal. Portugal. 02/10 Rally de Espana. Spanien. 03/10 Rally de Espana. Spanien. 04/10 Rally de Espana. Spanien. 23/10 Rally of Great Britain. Storbritannien. 24/10 Rally of Great Britain. Storbritannien. 25/10 Rally of Great Britain. Storbritannien. 25/01 Monte Carlo Monte Carlo. 26/01 Monte Carlo Monte Carlo. 27/01 Monte Carlo Monte Carlo. 28/08 Rally Nya Zealand. Nya Zealand. 29/08 Rally Nya Zealand. Nya Zealand. 30/08 Rally Nya Zealand. Nya Zealand. 31/08 Rally Nya Zealand. Nya Zealand. 05/12 Wales Rally GB. Storbritannien. 06/12 Wales Rally GB. Storbritannien. 07/12 Wales Rally GB. Storbritannien.